With temperatures scorching their way up the thermometer to the mid-90s, and with humidity so high it feels as if scuba gear is a requisite for breathing, I eagerly board my flight from Baltimore, Maryland, to Portland, Maine. Since it’s my first trip to the Pine Tree State and my first time on a Maine Windjammer, I’m filled with childlike excitement. An hour and a half drive up the road from the Portland airport is Rockland. It’s a quaint and salty town that is built on a vast boatbuilding and maritime heritage. As soon as I arrive, I do what any tourist worth their salt would do: I seek out the best-rated lobster shack I can find on Yelp, order up a lobster roll, and then enjoy the view as melted butter runs down my arms. Shameless tourist bucket list item complete, I make my way to the Rockland waterfront to meet Marti Mayne, the energetic and immediately likable events manager for the Maine Windjammer Association. Here, behind the Sail, Power and Steam Museum, we climb aboard Capt. Mike McHenry’s handsome lobster boat for the trip out to Isleboro, where we have plans to rendezvous with the rest of the impressive windjammer fleet. McHenry carefully steers us through a developing fog when a shape appears from the soup. “That’s the Mary Day!” he exclaims. Out of the fog bank appears a magnificent gray-colored schooner with a full complement of sails up, heeling hard and slicing through the water with a bone in her teeth. 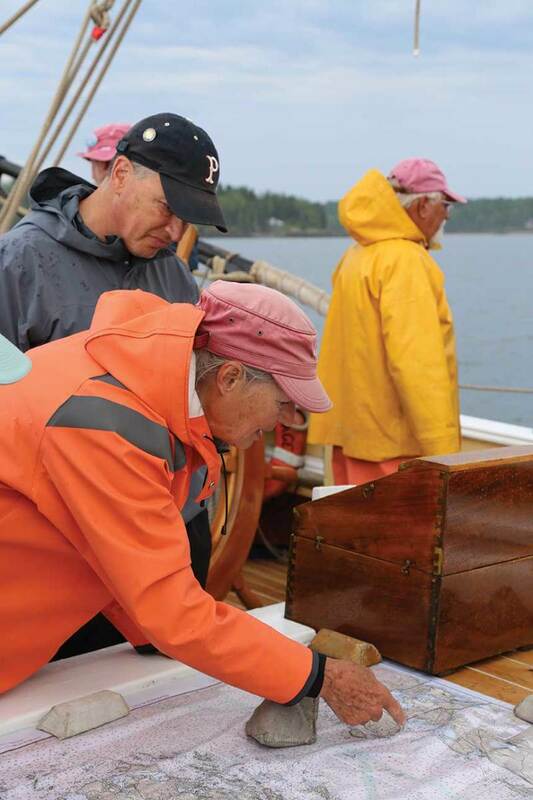 With no other boats around, it feels as if we’ve gone back in time more than 100 years ago when schooners like Mary Day ferried cargo up and down the Maine coast. Rocky outcroppings peppered with snoozing seals frame our trip up Gilkey Harbor until four anchored schooners come into view. Among the boats already on scene for the Great Schooner Race is Heritage, the 95-foot schooner I’ll spend the next 36 hours aboard. “Welcome aboard,” says a crew member as I lift my gear bag over the gunwale and negotiate the Jacob’s ladder to Heritage’s deck. I’m quickly escorted to my cabin below and stow my gear in what turns out to be a very comfy double-bunk cabin. Surprising are in-cabin “luxuries” such as a sink with hot water and electrical outlets for charging cellphones and tablets. Up on deck are two enclosed heads and a single shower with hot and cold water. I was seriously expecting to rough it a bit, but Heritage has all the comforts of home. Well, except for air conditioning. But hey, it’s Maine. 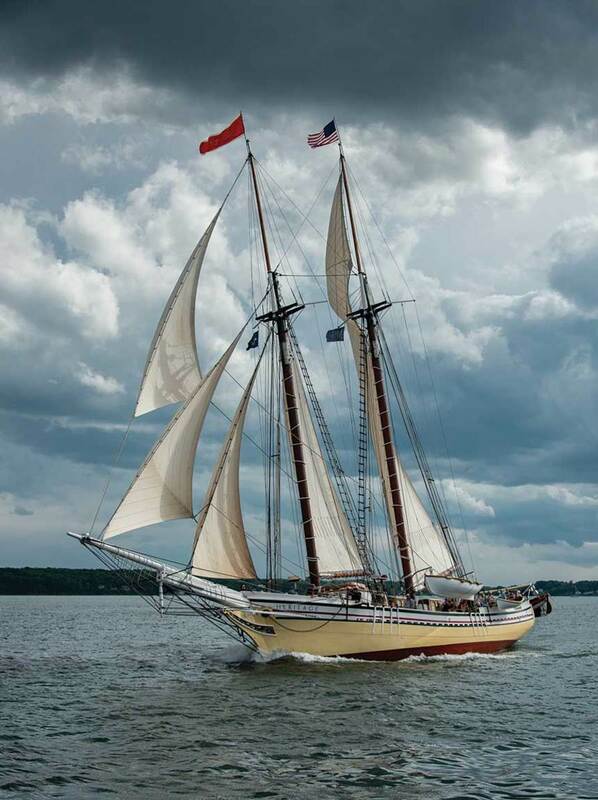 Heritage is the youngest member of the Maine Windjammer fleet and was designed and built by the husband-and-wife team of captains Doug and Linda Lee at their North End Shipyard in Rockland and launched in 1983. She is a coasting-class schooner, based on pre-World War I schooner designs and characteristic of cargo-carrying sailing ships of the time. She sleeps as many as 30 passengers in a variety of cabin setups. 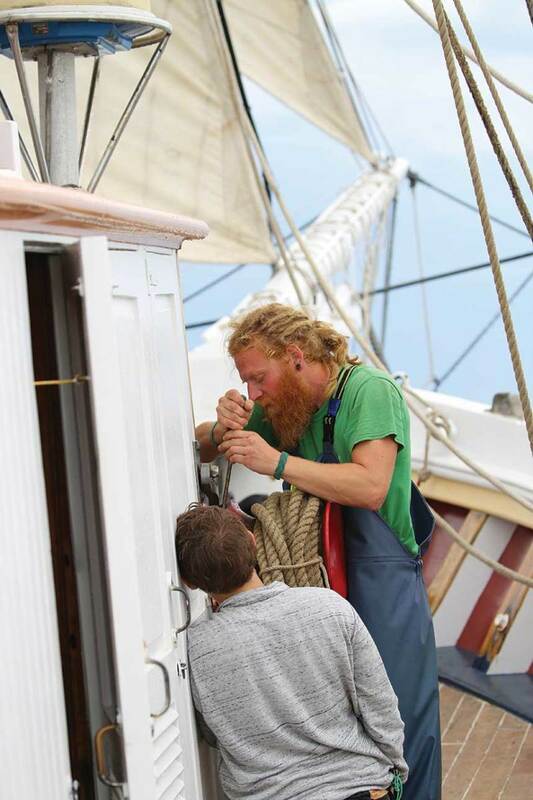 A crew of six (eight if you include the skippers) run, sail and maintain the schooner and are amazingly dedicated to tending to the needs of each and every guest aboard. Once I settle into my cabin, I climb up on deck to take in our view for the evening. 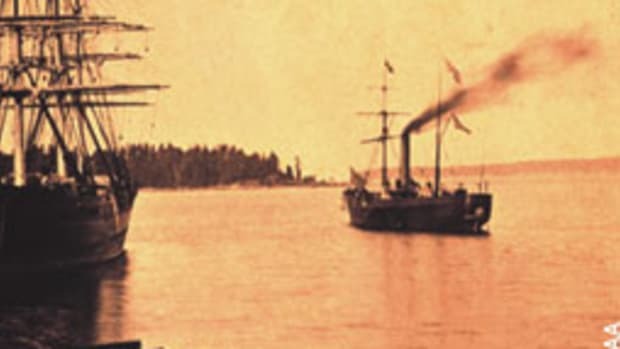 Additional schooners begin arriving with wind-filled sails, each heading up into the wind and then dropping anchor before crews wrangle vast expanses of sails down to the deck. Everywhere I look, there’s something new and exciting to watch. Capt. Linda Lee plots a course. I’m getting to know some of my shipmates and enjoying the crew-prepared happy hour spread (alcohol is bring-your-own on Heritage) when laughter erupts on the main deck. I forgot about the small boat race scheduled for the early evening. 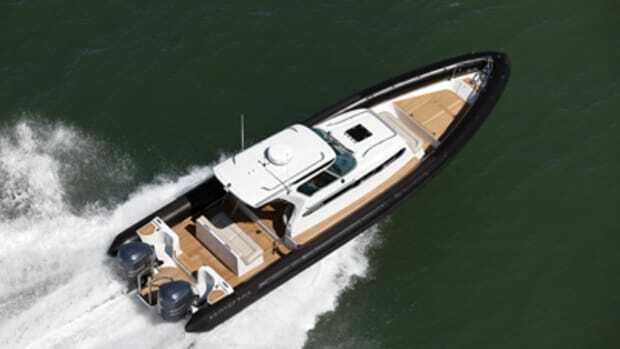 The event is a raucous and spirited row around the anchorage in everything from launches to small dinghies, and Heritage’s crew is definitely shooting for the spirit award. All six crew, from the ship’s cook to the engineer, have donned Speedos and various costume accouterments such as rainbow suspenders, a chef’s hat made from sailcloth, a pink feather boa, a flamingo hat and, well, you get the idea. It was hilarious. The whole ship laughs heartily as Capt. Doug reads a proclamation before the crew—and some very brave ship’s guests—pile into Heritage’s long launch, Archie, and get underway. Our crew didn’t win but watching them compete amongst eight or nine other similarly costumed crews around the anchorage is the highlight of the evening. A relative newcomer is Pamela Derringer, from Marblehead, Massachusetts, who is enjoying her second cruise on Heritage. 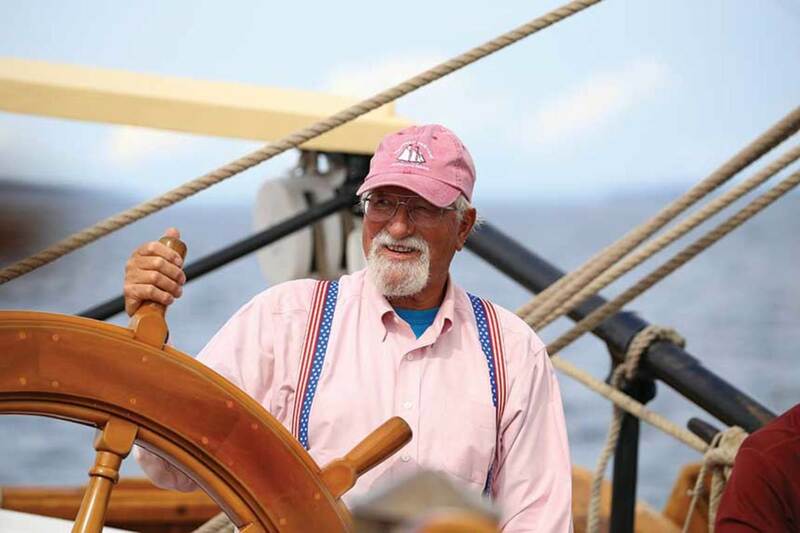 “I love the Heritage because it’s really cool to sail with a captain who designed and helped to build the ship himself,” Derringer says. 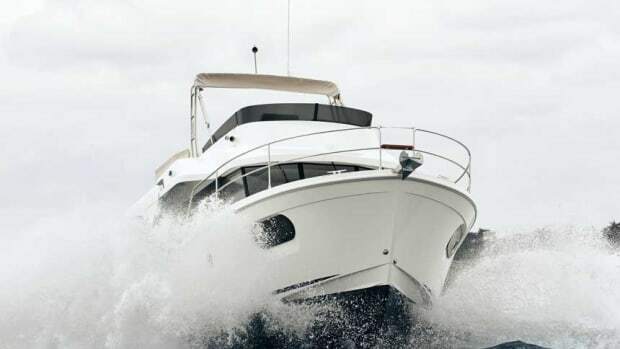 “The collegiality, teamwork and friendship among the crew and the captains are unique and special. Captain Doug is a natural raconteur, and it’s great fun to listen to him spin stories. The food is simple, delicious and plentiful.” Carol White, who lives in Palatka, Florida, is also fairly new to this cruise. This trip was her second aboard Heritage. 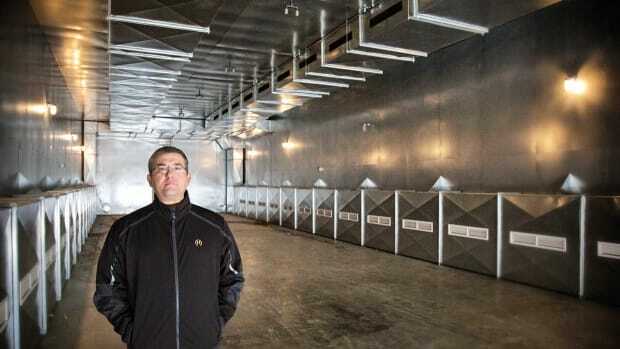 “The crew is awesome, and the food is fantastic,” says White. 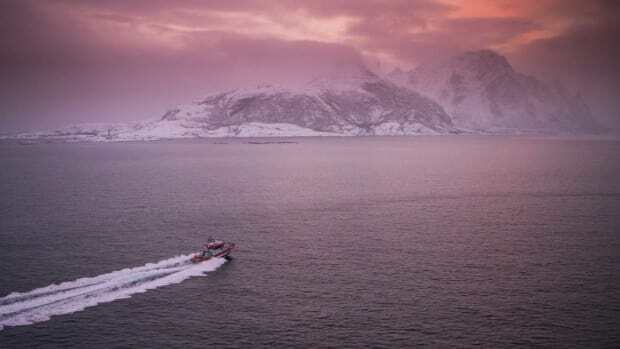 “The lobster bake was a dream come true.” I take a place up on the bow and enjoy the scenery before turning in for the evening. Crew ready sheets aboard Heritage. I’m awakened the next morning by the sound of deck brushes busily scrubbing overhead as the crew begins daily chores. It’s raining quite steadily, but it’s dry and comfortable under an expansive awning where folks have gathered to drink coffee, eat breakfast snacks, and socialize. Everyone seems excited about the race. Soon the rain ends, the awning comes down, and everyone snaps into action. The crew scurries around deck in a well-choreographed dance, as the engineer fires up an ancient auxiliary engine used to haul up the anchor and raise sails. It’s an interesting, single-cylinder machine that is loud and raw. Sometimes it belches smoke and unburned fuel into the air, but it makes quick work of raising the anchor. Once we’re off the anchor, the sails begin to go up and the push (yawl) boat is hauled up and stowed. Crews face off in a harbor race. The wind continues to shift, and Capt. Doug calls for a series of tacks, barking the commands to our crew. It takes four people to swing the three foresails around the forestays, but the young crew executes each move with military precision, performing a series of pushups after each tack to keep their sheet-hauling muscles in tip-top shape. Then finally, the wind fills in. Capt. Doug’s tactics pay off. The portion of the fleet that heads toward shore is now caught in the lee of the land while we enjoy unobstructed breezes. Other schooners are quick on our heels, though, and are now enjoying the same wind as the Rockport Breakwater comes into view. And then, before we know it, we’re passing the Rockport Breakwater Lighthouse in first place as spectators cheer from the rocks. It’s a sweet feeling as we make a few victory laps around the harbor before anchoring up for the evening. But unfortunately, it was my time to go. Schooners take laps after crossing the finish line at the Rockland Lighthouse. I crowd aboard Archie with a handful of shipmates who are headed to the award ceremony. A powered launch from one of the other schooners bellies up against Archie and tows us to shore, saving our crew from a mess of rowing. I offload my gear at the Steam, Sail and Power Museum before finding out the hard way that leaving the “automatic” lights on in a hybrid car with two batteries is essentially the same as in any other car, except you can’t start the car with the hybrid battery. 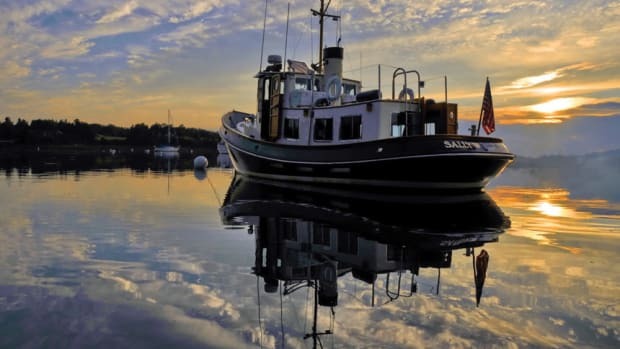 I spend the time waiting for AAA to arrive looking at reservations for Heritage’s 2019 sailing season and am dumbfounded by the reasonable cost for a week of cruising (a little more than $1,000 for a week of all-inclusive Maine sailing). I’m eyeing a weeklong stay aboard Heritage in July for me and my spouse. Yup, this experience is that good. 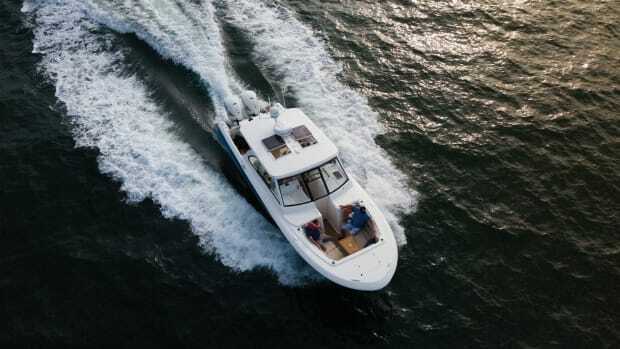 Beneteau is replacing one of its best-selling models—the Swift Trawler 34—with a new 35. We go onboard to see how well she measures up against the first. Boating Books Review: Can You Canoe? 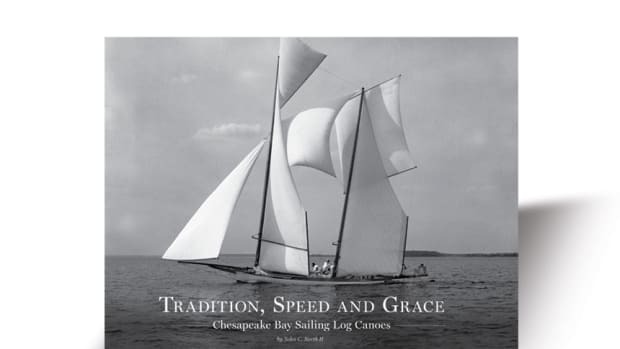 With masts reaching high into the sky and carrying more canvas than any boat their size should, Chesapeake Bay log canoes require a hefty crew perched outboard on long boards to keep them balanced and upright. 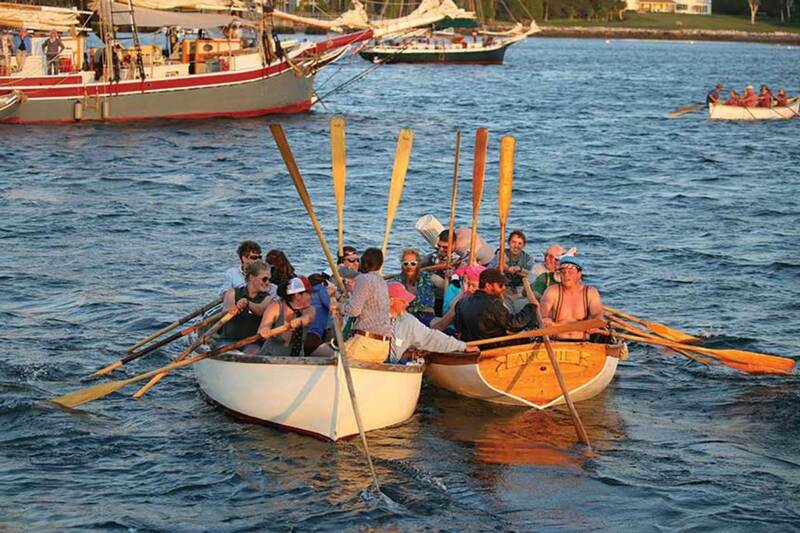 Watching crews manhandle these graceful, overpowered vessels is a summer Eastern Shore tradition.